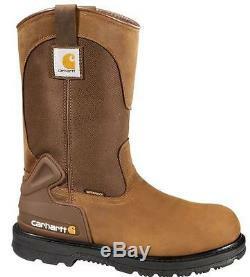 Wrangle your workload with ease in the Carhartt® Men's Bison 11'' Waterproof work boot. An oil-tanned leather upper boosts protection with abrasion-resistant Corudra® nylon, absorbing shock for ultimate comfort. A waterproof membrane guards against the elements, while an OrthoLite® insole enhances cushioning for lasting support on long jobs. The dual-density PU outsole grips terrain for ultimate traction and performance. Oil-tanned leather upper provides above-the-ankle protection. Abrasion-resistant Corudra® nylon boosts support and shock-absorption. Waterproof interior membrane delivers ultimate protection against the elements for dryness and comfort. OrthoLite® insole delivers superior cushioning for lasting support and comfort. Direct-attach welt construction increases outsole performance. Dual-density PU outsole intensifies grip on oil, chemical, and snow-covered surfaces for superior traction. The item "Carhartt Men's Bison 11'' Waterproof Steel Toe Work Boots CMP1200" is in sale since Tuesday, March 7, 2017. This item is in the category "Clothing, Shoes & Accessories\Men's Shoes\Boots".